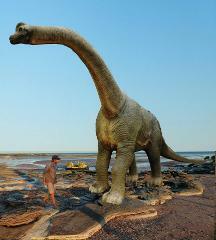 Travel back in time to see dinosaur footprints in Roebuck Bay. Then be transported out onto the tidal flats, viewing the diverse marine life whilst enjoying hors d'oeuvres and a glass of sparkling wine whilst waiting for the Sunset!! Be transported back in time to see 120 million year old dinosaur footprints. This hour long tour highlights the magnificent scenic and prehistoric sights of the Broome town coastline. Get up close to the World War 2 Flying boat wrecks. This tour is only possible 20 times a year. Please check calendar for available tour dates.